All the goals came in the second half as Neil Reynolds’ men were put to the sword. 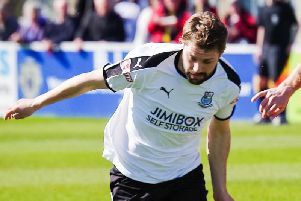 Will Annan scored twice for the hosts in the closing stages, after Aiden Savory (57) and Aaron Hardy (74) had started the ball rolling. Harrison Sheppeard (82) added the fifth. Elsewhere in the division, Kendal Town were beaten 3-1 at home by Goole AFC, Steve Yawson netting for the hosts. Clitheroe’s game at Brighouse Town fell victim to the weather, as did Southport’s visit to Darlington in the National League North. In the NPL Premier Division, goals from Craig Carney (33) and Sam Bailey (45) gave Lancaster City a 2-1 win over Sutton Coldfield Town at the Giant Axe. And in the NWCL Premier Division, Charnock Richard lost 2-1 at home to West Didsbury and Chorlton, Carl Grimshaw getting their consolation goal. Burscough lost 4-2 at Congleton Town, Prince Ekpolo scoring both Linnets’ goals.